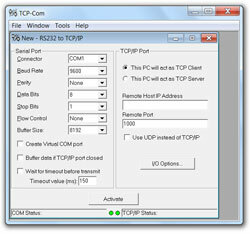 In the TCP/Com window just select the com port number and the serial communications parameters for your serial device and enter an IP address and a socket number. Then activate! It's that easy! Com port data will appear at the IP address and data from an IP port will appear at a real or virtual com port. Version 7.0.4 (released June 2014) Fixed rare issue with "Remote Pings" feature not functioning correctly.